This gives pretty good results. One thing to note though is that the red channel of an image contains less texture information, and so desaturating the left eye image slightly before separating the channels can give better results. You can see in the node set-up above I have used a HSV node to do this. The method also works for animation – just import a sequence or movie file for each eye (yup, you’ll have to render twice) instead of a still image. That’s a great tip for combining the two images. Sounds cool. Leave a comment when it’s done! Nice work. You have some great results there. World of thanks to you for this! I’ve been wanting to do a 3D version of the movie that I’ve been creating these past few years. I fetched one of the 3D glasses that we’ve kept around the house to see if they would work with the image you placed here. It did. Now, I wish that you were able to offer us a short video sample. I referred to the image of the male bust. I just noticed the gun and animated gif reference. I loaded the gif and watched the the 3D glasses. I could still see the red and blue. Isn’t there supposed to be some sort of shift in the yellow channel? Perhaps, a slight one? Also, as I recall from viewing the classic 3D movies many years ago when I took my glasses off the scenes appeared blurry. I think, 3 cameras were used back in the day. Maybe, if we try using a 3 camera technique we might find a way to get more of the 3D effect? Perhaps, soften (Blur?) the red and blue channels? Just a thought. Anyhow, I still appreciate the info in your post. It has inspired me to experiment. If you get the jump on me to experiment with what I’ve suggested, please post your results. I’m afraid to say I think you’ve got the wrong end of the stick there. For one, there is no such thing as a yellow channel, and secondly only two cameras are necessary, as humans only have two eyes – one camera for each. As far as the blur – this occurs because you are looking at two images from different viewpoints combined together, no actual blurring of either image is being done, this would only degrade their quality. One thing that can improve the effect is careful mixing of the red channel with a greyscale copy of the other channels to improve the contrast of that layer before combining the two images to make an anaglyph. You’ve probably got low quality glasses? Here the gun has a terrific stereo effect and no red/blue ghosts are visible. 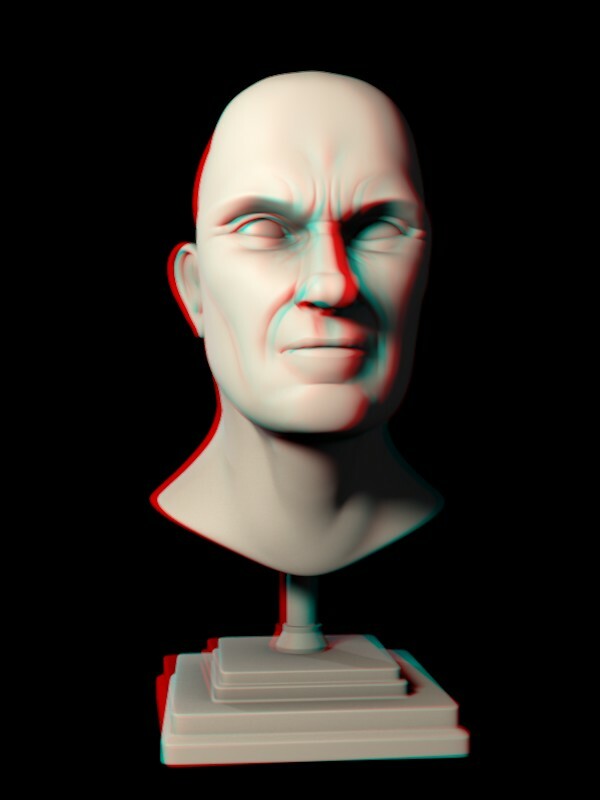 Are you sure you’re using left-red right-cyan glasses and not flipped or red/green ones?